WASHINGTON (CNN) -- In a sign of progress in overhauling health care, the nation's pharmaceutical industry has agreed to a deal that will reduce drug costs for elderly Americans. 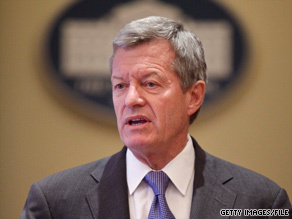 Sen. Max Baucus says the deal will reduce $80 billion in Medicare drug costs for the elderly over the next 10 years. The agreement negotiated by Sen. Max Baucus, D-Montana, discounts medications for Medicare beneficiaries who currently face high out-of-pocket expenses when their benefits reach a gap in coverage, according to statements Saturday by Baucus and the Pharmaceutical Researchers and Manufacturers of America. President Obama praised the agreement as a "turning point" in efforts to forge a national health care reform plan that both cuts costs and expands coverage to the 46 million uninsured Americans. "Key sectors of the health care industry acknowledge what American families and businesses already know -- that the status quo is no longer sustainable," Obama said in a statement Saturday. "The agreement reached today to lower prescription drug costs for seniors will be an important part of the legislation I expect to sign into law in October." Baucus said in his statement that the deal amounted to an $80 billion reduction in Medicare drug costs for senior citizens over the next 10 years. "This new coverage means affordable prices on prescription drugs when Medicare benefits don't cover the cost of prescriptions," Baucus said. Overhauling health care is a top priority of the Obama administration, but initial proposals to reach Congress last week received a rocky reception. Republican opponents immediately slammed the measures, and the Senate Finance Committee chaired by Baucus delayed scheduled hearings on one of the measures. Hearings by the Senate Committee on Health, Education, Labor and Pensions on the other measure began amid partisan bickering, with hundreds of amendments proposed by Republican opponents. Republicans accuse Obama and Democrats of trying to rush through what they say is flawed legislation in 2009, before the politics of midterm elections in 2010 and the 2012 presidential race. The parties agree on several principles, including an emphasis on preventive care, cost-cutting measures in existing Medicare and Medicaid programs, and a halt to denials of coverage because of pre-existing medical conditions.